By December 1944 proposals had been received from Boeing, Convair, Martin and North American for medium bomber for tactical and operational level use. When Boeing began to design the Boeing B-47 Stratojet jet bomber in 1943 it was very like a jet version of the B-29. The configuration changed several times and eventually the pro-totype was given a wing and tail swept at 35 degrees to postpone high-subsonic drag rise, with six jets in pylon mounted pods. Another unusual feature was the bicycle landing gear. As it had for the B-36, the Truman Administration's stringent financial restrictions worked in favor of the B-47. Pressed for money, the Air Force decided to buy more B-47s instead of purchasing additional B-50s or future B-54s, since neither one of those rather expensive bombers had any growth potential. 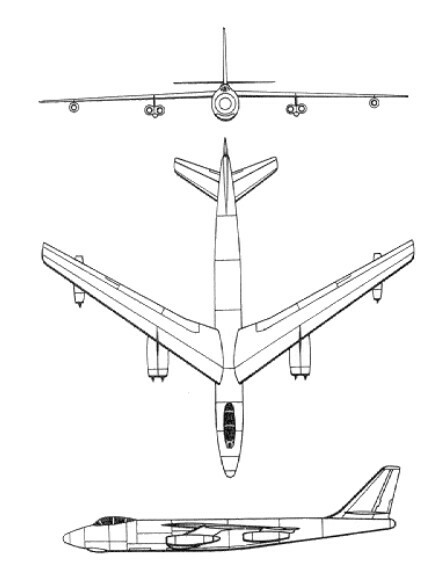 Hence, even though the B-47 was yet to fly, the initial production order of 1948 was increased in mid-1949. The subsequent Korean War, rising world tensions, and mounting urgency to build an atomic deterrent force raised the tempo of the B-47 program. In December 1950, the Air Force foresaw a monthly production of 150 B-47s, but still recommended changes, making it almost impossible to settle on an acceptable type. Even though its capabilities removed the B-47 from the tactical/operational level to the strategic arena, the USAAF was still interested in the more limited type, and the other three 1944 submissions reached hardware form. The new design did away with the danger of fuselage-mounted or in-wing-mounted engines’ disturbing the airflow over the wing or making a mess of things if they shed tur-bine blades either because of malfunction or combat damage. The six engines were mounted two to a pod about halfway out under the wings, with singles near the end of the wings. Another innovation was to mount the main landing gear under the fuselage one behind the other, in tandem. Spindly, diminutive outrigger landing gear halfway out along the wings kept the whole thing from toppling over on the ground. The first of two Boeing XB-47 prototype (46-065) was rolled out of Plant 2 at Boeing Field, Seattle on 12 September 1947. First flown on 17 December 1947, (by Robert Robbins and Scott Osler) 46-065 was followed by 46-066 on 21 July 1048. Because the early jet engines did not develop large amounts of thrust at low speed, the prototype had provision for 18 assisted take-off rockets. Nine on each side of the fuselage. Early tests were not without incident. Pilot Scott Osler was killed when the canopy came off at high speed. The co-pilot landed the aircraft and the canopy was redesigned. Delivery of the B‑47A began in December 1950 and these impressive machines intro­duced a new level of performance, complication and technology to military aviation. The tail guns were sight­ed from the nose, and the two pilots sat in a tandem fighter‑like cockpit with access from a ventral door and stair­way. Enormous fuel loads could be housed in the fuselage and the B‑47B and later models carried giant 5683­ litre (1,500‑US gal) drop tanks under the wings. Various rocket installations could boost the long take‑off, and a large braking parachute helped arrest the landing. First flying on 26 April 1951, 398 B-47B were built. 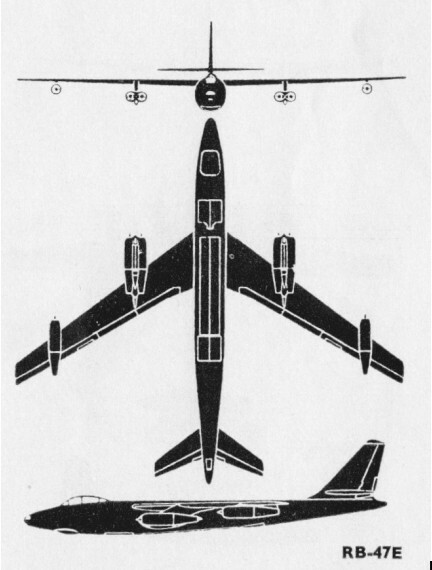 Most were modernised the B-47E or B-47H standard. In 1951 alone, the Air Force took delivery of 204 B-47Bs, none of which were suitable for combat. The aircraft's canopy was unsafe; the B-47B had no ejection seats (a deficiency shared by 200 successive B-47s); the bombing and navigation system was unreliable; a new tail defense system was needed; and the jet engines were creating unique development problems such as fuel boil-off at high altitudes, which reduced the aircraft's range-already shorter than anticipated. In sum, the hasty production of an aircraft as revolutionary as the B-47 proved to be costly, generating extensive, unavoidable modification projects like Baby Grand, Turn Around, High Noon, and Ebb Tide. Yet once accomplished, the B-47 modifications worked. 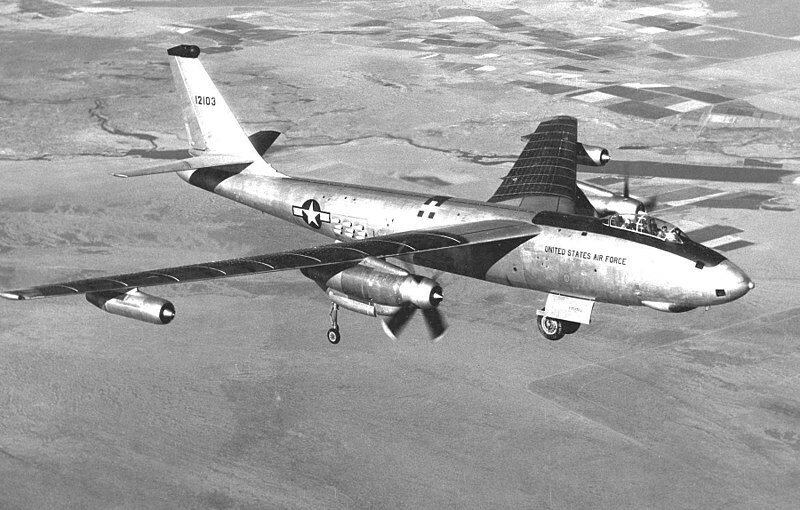 Beginning in 1951, two XB-47Ds were modified from B-47Bs as purely experimental platforms, with a Wright YT49-W-1 turboprop engine spinning a four-paddle prop, replacing each of the inboard two-jet pods. Difficulties with engine development delayed first flight of the XB-47D until 26 August 1955. The aircraft's performance was comparable to that of a conventional B-47, and its reversible propellers shortened the landing roll, but the USAF did not follow up the idea. The first swept-wing jet bomber to be built in quantity was the Boeing B-47 Stratojet that began to equip the USAFs 306th (Medium) Bomb Wing in mid-1951. Finally deployed overseas in mid-1953, the B-47s totally replaced the obsolete, atomic-carrier B-50s by the end of 1955, when new B-47 production models were delivered that could carry larger fuel loads and thus had greater range. After the B-47 demonstrated that it was rugged enough for low-altitude bombing, some of the aircraft were again modified to satisfy a new set of requirements levied in 1955. These modifications also worked, and in 1957, the Air Force publicly demonstrated its new low-altitude, strategic bombing tactics, an achievement marking the beginning of an era in aeronautics. At the peak of its utilization in 1957, Strategic Air Command had some 1,800 in service. Despite the fuel capacity the range was too short for SAC's main global missions, but over 2,200 Stratojets were delivered, mainly of the B-47E type, and they operated from the UK, North Africa, Pacific islands and many other areas. The first of the 1340 B-47E version built flew in January 1953 with the B-47E and RB-47E reconnaissance-bomber (which has modified nose containing cameras) still in production in 1955. Many were RB‑47E and RB-47H reconnaissance versions or ERB‑47 'ferret' Elint (electronic intelligence) platforms. The ERB-47H had a pressurised compartment for three electronic operators in its bulged bomb-bay. The B-47B first flew on 16 April 1951. Despite its convoluted start, the B-47 program proved successful. The aircraft served in various roles and was involved in many experimental projects, some connected to the development of more sophisticated atomic weapons, like Brass Ring, or with the development of air refueling or other endeavors of great significance to the Air Force. Strategic Air Command's last B-47s went into storage in early 1966, while a few converted B-47 bombers and reconnaissance models remained in the Air Force until the end of the 1960s. The last B-47 was retired from active duty in 1969. Including the main training wing, the 2032 B-47s built equipped 30 Bomb Wings. In 1956, a U.S. Boeing B-47 Stratojet was loaned to the Royal Canadian Air Force to flight test the Iroquois for use in the CF-105. Canadair, the sub-contractor, attached an Iroquois to the right side of the bomber's rear fuselage, near the tail, simply because there was no other place to mount it. Designated CL-52 by Canadair, it was a nightmare to fly, since the thrust was asymmetrical; this created great problems for flight control. After the Arrow project was cancelled, the B-47B/CL-52, which had logged about 35 hours of engine flight tests, was returned to the U.S and subsequently scrapped. 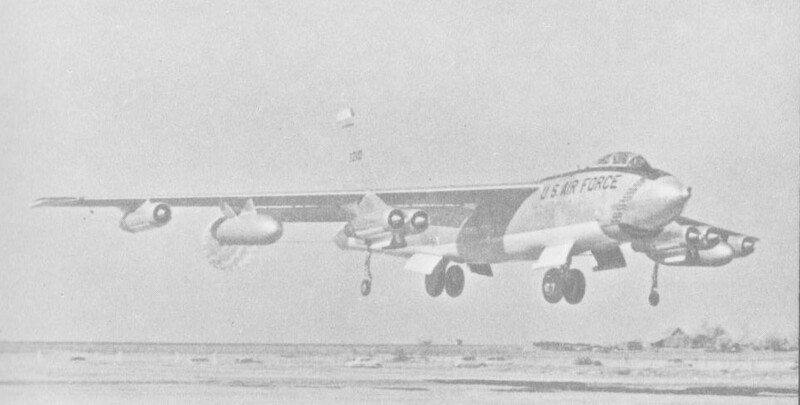 The CL-52 was the only B-47 used by any foreign service. Engines: 6 x General Electric J47-GE-23 turbojet, 5800 lb thrust. Wing span: 116 ft (35.36m). Wing area: 1428 sq.ft (132.66sq.m). Max wt: 185,000 lb (83,914 kg). Max speed: 617 mph @ 10,600 ft.
Armament: 2 x .50 in mg. Payload: 20,000 lb internal bomb load. Wing span: 116 ft 0 in (35.36 m). Length: 109 ft 10 in (33.48 m). Height: 27 ft 11 in (8.51 m). Max TO wt: 206,700 lb (9,760 kg). Engines: six 2722 kg (6,000 lb) thrust General Electric J47 GE 25 or 25A turbojets (wet rating). Max speed: 975 km/h (606 mph) at medium altitudes. Service ceiling: 12345 m (40,500 ft). Range with bombload: 6440 km (4,000 miles). Maximum take off 104330 kg (230,000 lb). Wing span: 35.36 m (116 ft 0 in). Length: 33.50 m (109 ft 10 in). Height: 8.51 m (27 ft 11 in). Wing area: 132.7 sq.m (1,428.0 sq ft). Armament: two 20 mm guns in tail turret; internal bombload of 9072 kg (20, 000 lb).